Cold spraying is a solid-state coating process and promising technique for additive manufacturing. However, questions raise about the bonding mechanism between the particles forming the coating. 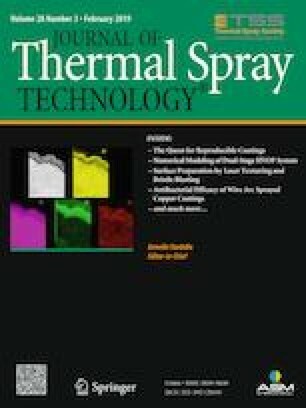 In this study, the strengthened peening effect is proposed as the determining factor for the formation of metallurgical bonding in cold spray additive manufacturing. Ni coatings and single splats were produced on Al substrates with different propelling gas pressures. Contrary to common understanding, no metallurgical bonding was observed in single-particle impact, even at the pressure of 3.7 MPa. However, the metallurgical bonding was observed at the full coating deposition through the existence of diffusion after heat treatment. Thus, the strengthened peening effect of subsequent particles with successive impact energy might be the determining factor for the formation of metallurgical bonding. Actually, strengthened peening effect significantly improved the coating quality through enhanced metallurgical bonding, which was proved by the increasing adhesion strength and decreasing porosity. A correction to this article is available online at https://doi.org/10.1007/s11666-019-00863-3. The authors would like to acknowledge the supports by GDAS’ Project of Science and Technology Development (Grants No. 2018GDASCX-0945), Natural Science Foundation of Guangdong Province (Grants No. 2018A0303130075), International Cooperation Project (Grants No. 201807010013) and High-level Leading Talent Introduction Program of GDAS (Grants No. 2016GDASRC-0204). As one of the authors, Chaoyue CHEN would like to acknowledge the supports by Joint Funds of the National Natural Science Foundation of China (Nos. U1560202 and 51690162, 51604171), the Shanghai Municipal Science and Technology Commission Grant (No. 17JC1400602), and the National Science and Technology Major Project “Aeroengine and Gas Turbine” (2017-VII-0008-0102).